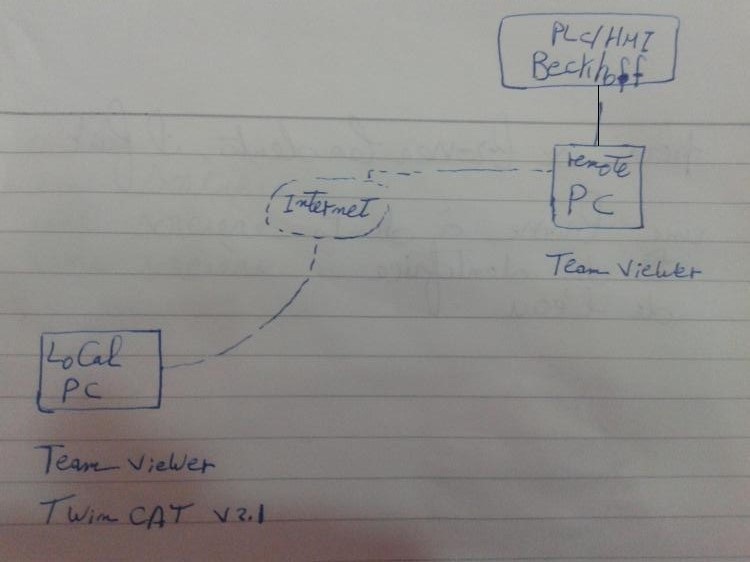 Please explain How to set TeamViewer VPN for programming remotely with Bckhoff PLC and Beckhoff HMI/IPC? The engineering tools installed only on the local PC and the Remote is a Gateway to the PLC. What are the possible ways to perform this action? What are the procedures to perform this communication? I have only used it so, that the engineering tools are on the remote PC and i connect with team viewer and use the engineering tools remotely. I do not know, if it's possible to have your setup with team viewer. But I do not know exactly the procedures to make the communication. I don't believe it's possible... TeamViewer is a Desktop Remoting app as far as I know, that means you can only access what's inside the Remote PC, but not using programs from your Local PC to access the Remote PCs network, USB ports, and so on. You don't need TwinCAT installed on your Local PC, instead it has to be installed on the RemotePC. Then you remote it via TeamViewer and run the TwinCAT there. This an example for Siemens PLC. Is this method applicable for Beckhoff PLC? Well, if that does work it's a new info to me. 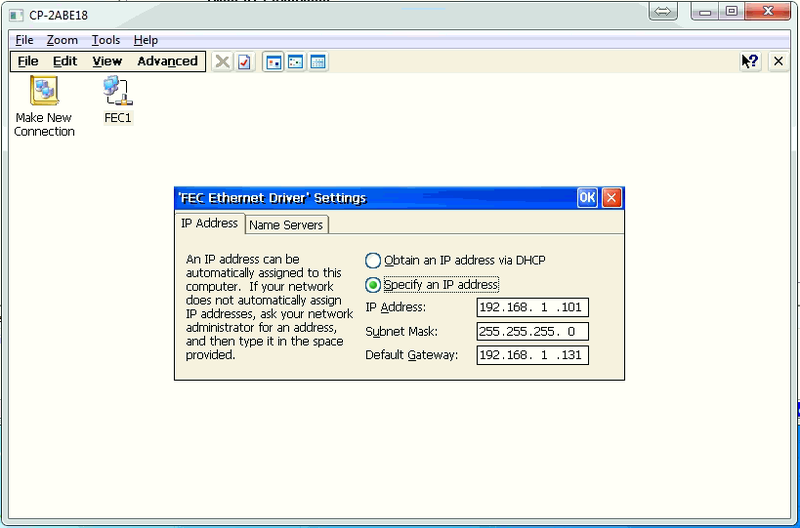 Personally I'm not an active Beckhoff user, but Ethernet TCP/IP on whatever device is the same, so you just need to replicate the required stuff in Beckhoff settings (like gateway and Registry settings). I might try this later on, but using Omron PLC. So I want a confirmation from any Beckhoff user about this method. Have you tried the following info website regarding TwinCAT ADS connectivity? Team Viewer is a remote access program which will show you the remote screen and allow you to access the remote PC. It's not a tunnel to connect your PC to the remote network. So in this case, the programming software has to be on the PC which is connected to the PLC, not on your PC. Is this method applicable for Beckhoff PLC/HMI? I find zero mention of a Team Viewer VPN product on their website. I just found out from this article HERE that TeamViewer did have a VPN utility inside (already checked with my TeamViewer program also). Already,I set TeamViewer VPN before. 1-Is this method applicable for Beckhoff PLC/HMI........? 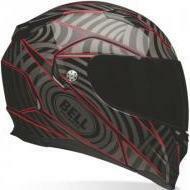 2-Can Beckhoff Support confirm this method...? In Egypt,Beckhoff support not reply for this question. 3-What are the procedures to perform this communication? We are not Beckhoff Support. We are a group of other automation users who volunteer our time to help people with PLC questions. If you want an official response from them, I would wait for them to reply to your messages. Nobody here is an expert in all products, and maybe there are not as many members familiar with Beckhoff as other vendors. it may take longer to get a response. I was also interested if this works and had 2 Beckhoff PLCs (Panel PC CP6606 and CP2611) to try this method. It works like a charm - I just followed the steps from the PDF you attached. Only difference is the last step - in TwinCAT System Manager when you go to "Add Route Dialog" you have to enter IP address of the PLC in the "Enter Host Name / IP:" field and click on the button (not "Broadcast Search" as if you are searching for the PLCs in the LAN). And yeah, I didn't have 2 network adapters on the remote PC as it is stated in the PDF, remote PC and PLC are both connected to an ordinary ethernet switch. 1- Can you explain only the last step you did for remote access to Beckhoff PLC/HMI as attached file with photos?
" 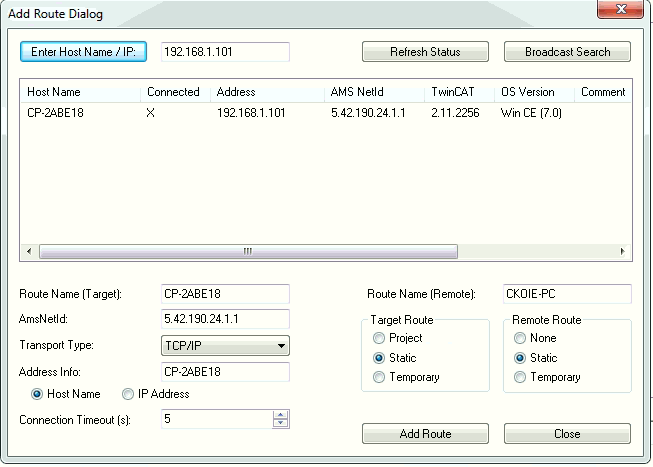 in TwinCAT System Manager when you go to "Add Route Dialog" you have to enter IP address of the PLC in the "Enter Host Name / IP:" field and click on the button (not "Broadcast Search" as if you are searching for the PLCs in the LAN). And yeah, I didn't have 2 network adapters on the remote PC as it is stated in the PDF, remote PC and PLC are both connected to an ordinary ethernet switch. " 3-Why do you not select:Broadcast Search ?
" I didn't have 2 network adapters on the remote PC"
You intend :2 Adapters on Remote PC or on Local PC which contains the engineering software tools? Face Book, I had to manually enter the IP address - broadcast search didn't work for me. Why? I didn't dig that deep into it - you'll have to answer Beckhoff staff specifically about that. 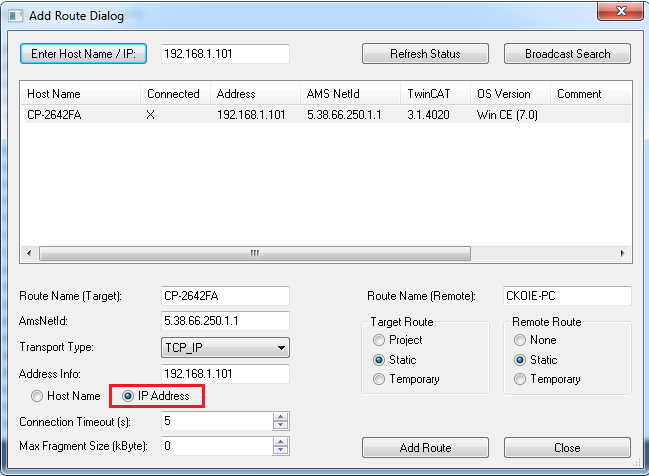 I forgot one last thing, after the PLC is found by the IP address you entered manually, before clicking "Add Route" you have to select "IP Address" instead of "Host Name" (see the attached picture). As for the other question, the Siemens PDF states: "There will be two Ethernet network cards in the remote PC. The remote PC is connected to the machine or process LAN, via the first Ethernet card, with a fixed IP address. The remote PC is connected to the internet, via the second network card, typically connected to the company office-LAN." Like I said, this isn't necessary - my remote PC has one Ethernet network card connected to the switch which is connected to a 3G/4G router so my remote PC has internet connection through this router.